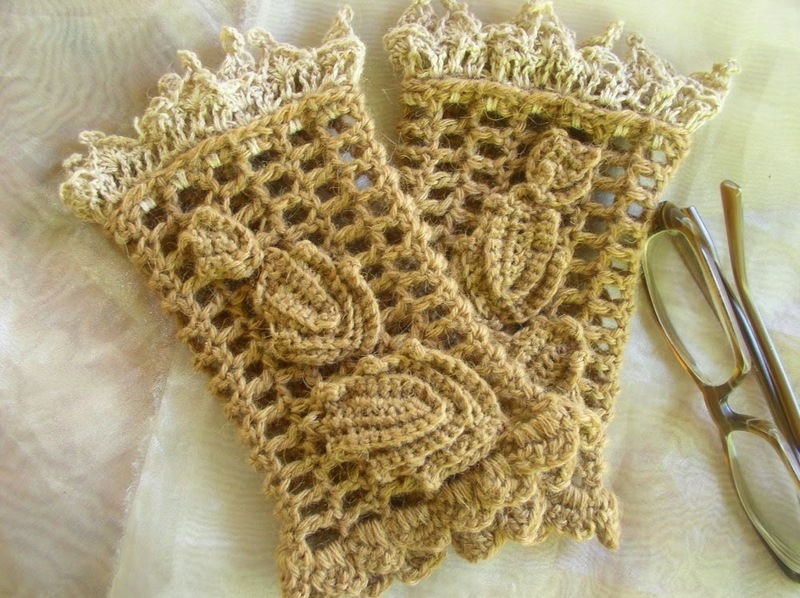 These wrist warmers are crocheted in a simple mesh pattern. 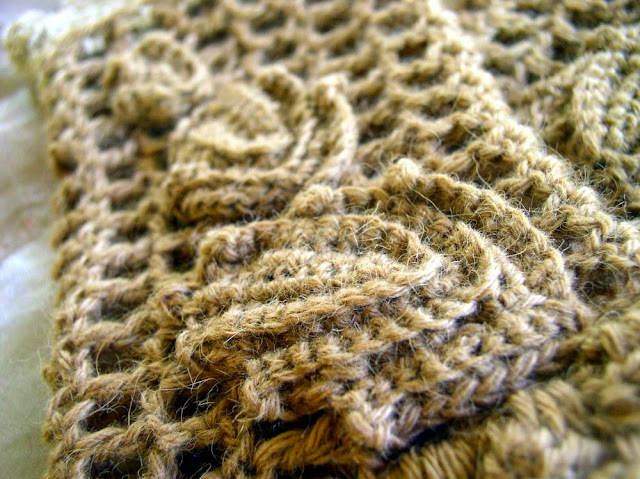 Crocheted leaves and a fine trim decorate what is just a basic fingerless mitt pattern. The length and width of the wrist warmers can be easily adjusted by increasing the length of the foundation chain to desired length of the wrist warmers and by adding more rows to adjust the desired width. The wrist warmer is worked in rows along the length using Baby Camel Yarn and larger hook, working vertically in rows until you reach the desired circumference. Start with a longer chain if you want a longer wrist warmer. The wrist warmer is a simple mesh of double crochet stitches separated by a single chain space. 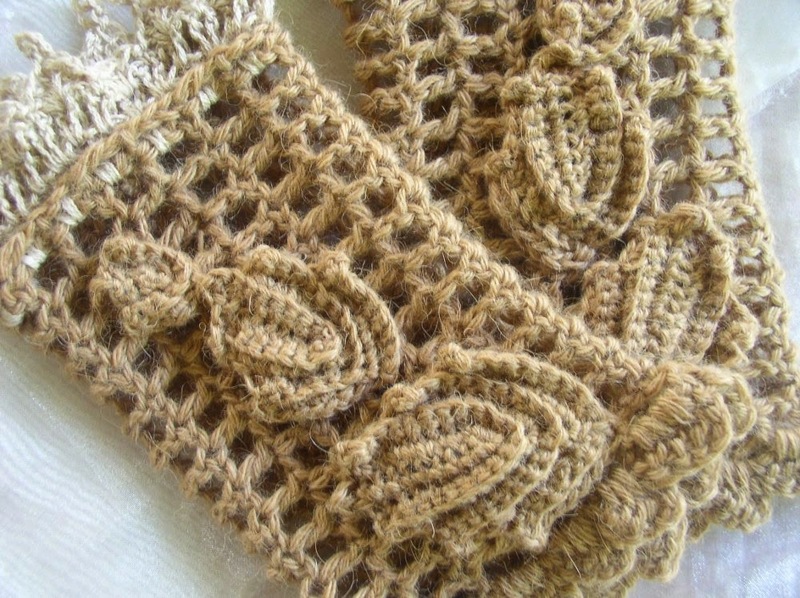 The upper edge of the wrist warmer has rows of 2 double crochet stitches next to each other (the second double crochet is where the lacy silk-camel edging is worked into) while the lower edge of the wrist warmer has the double crochet and chain space. So you must end the row on the side where you can continue working along the lower edge of the piece. Then a scallop edge is worked all along the lower edge of the wrist warmer. 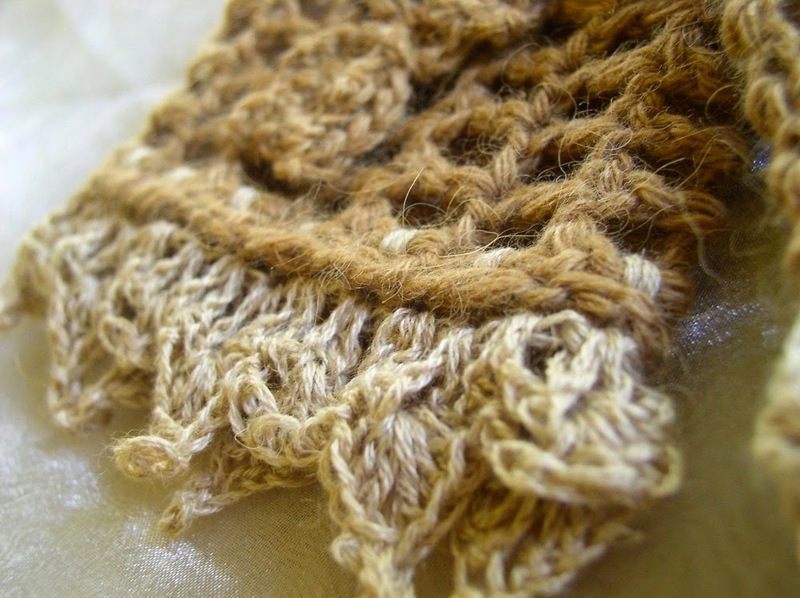 The lacy edging is worked in Silky Camel Lace Yarn in two strands held together using smaller hook. 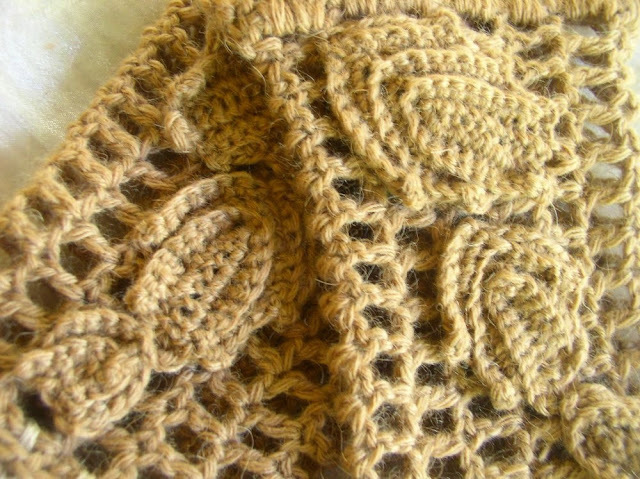 The lace edging is done in 3 rows, started by joining the yarn with sc around the stem (or post) of the second double crochet along the upper edge of the wrist warmer, right side facing. 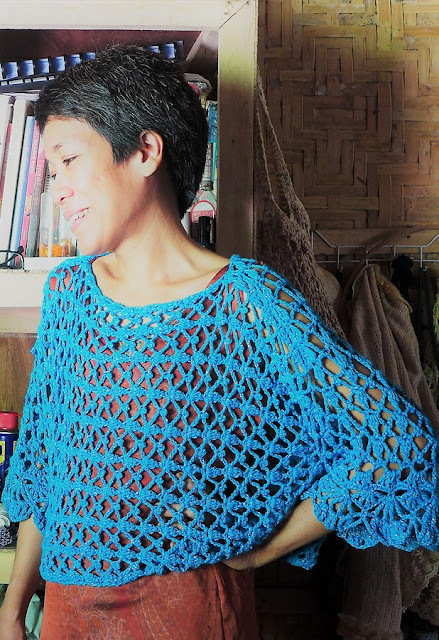 The leaves are crocheted separately then sewn onto the mesh. Then the seams of the wrist warmers are sewn together. No buttons or ties. Baby Camel yarn worked in this pattern stretches only a bit so measure your size accordingly. Row 3: Sk first dc and next ch, dc in next dc, *ch 1, sk next ch, dc in next dc, rep fr * all across, up to the second to the last dc, dc in last dc. Ch 3, turn. 3 dc in first sp, *sc in top of next dc, ch 3, 3 dc in next sp, rep fr * all along the edge of the wrist warmer, up to the last sp. End with sc in top of last dc. Fasten off. The leaves are worked starting with a foundation chain as the midrib, then sc across the foundation chain and continue sc across the other side of the foundation chain, leaving 2 (or so) ch stitches unworked. Ch 1, and turn, then work sc in each sc leaving the last 2 sc’s unworked, also not forgetting to make 3 sc’s in the sc at the base of the leaf to make a gradual turn to the other side of the leaf. Ch 1, and turn again, and work sc’s in each sc, etc. The sc’s are worked in back loops only as the back loops create a nice ridged texture on the leaves. Each (ch 1, turn) makes the pointed serration of the leaf. The large leaves start with a longer foundation, allowing for more (ch 1, turn) and thus a larger leaf. Using baby camel yarn and smaller hook, ch 12. Using baby camel yarn and smaller hook, ch 10. Row 1: Sc in 2nd ch fr hook (this would be the tip of the leaf) and in each ch across. Two more sc in last ch so that you turn to the other side of the foundation chain. Sc in next ch leaving last 2 ch unworked. Ch 1, turn. Using baby camel yarn and smaller hook, ch 6. Continue in this manner working back loop sc in the sc across until you have a leaf with 3 serrated points. (The larger leaf has 7 serrated points and the medium leaf has 5 serrated points). Block and Dry. 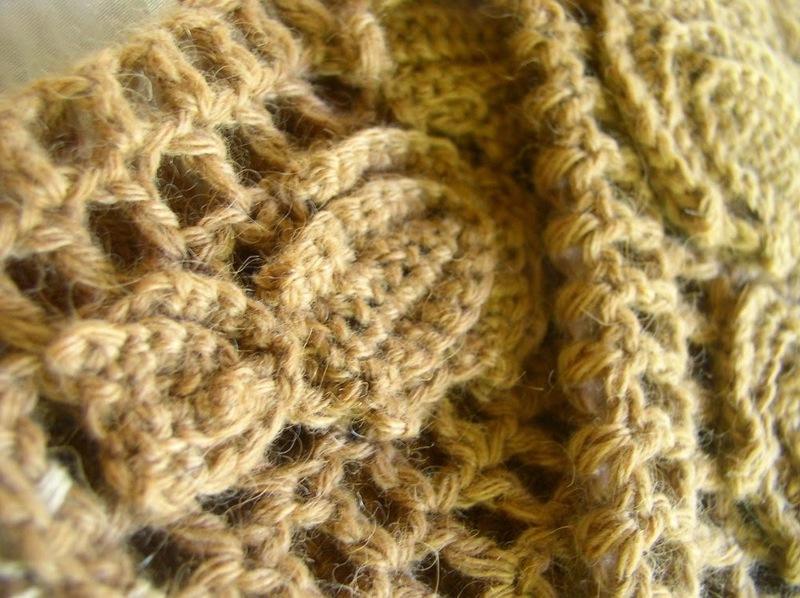 Sew the leaves onto the mesh, then sew the seams of the wrist warmer together.